MUDLICIOUS! The seafloor provides food & habitat for animals like corals, sponges, and invertebrates that larger sea life rely on. Greater Farallones National Marine Sanctuary remote-samples its silt and specimens to learn about these relationships. Check out this speacial underwater habitat. Get into Your Sanctuary Weekend is here! How are you celebrating? If you are still looking for an exciting adventure in your sanctuary, check out the new Get Into Your Sanctuary Storymap! Dive into your sanctuaries! Stop by the Greater Farallones Visitor Center to take a virtual reality dive into the sanctuaries. August 4 & 5, 10am-4pm. Free! No reservation required. Immerse yourself in the ocean and your national marine sanctuaries without getting wet! These virtual reality voyages use 360-degree images to highlight the amazing habitats, animals, and cultural resources you can find in each national marine sanctuary. Learn more about all of our Get Into Your Sanctuary activities. 7/16/18 - Happy Marine Life Monday! The one-spot fringehead (Neoclinus uninotatus) is a very territorial fish that is usually found hiding inside rocky crevices or even man-made items; such as bottles or tires that have ended up in the ocean. Females lay eggs, at which time the male takes over and guards them until they hatch! You can spot fishermen pull in salmon and striped bass, along with a variety of other ocean species such as surfperch and jacksmelt at the Pacifica Municipal Pier at Sharp Park. On the beach, early risers may see large flocks of Brown Pelicans (Pelecanus occidentalis) doing their share of fishing as well. In the mood for a hike? Continue south to Mori Point where several trails lead from the beach up to the ridge at the summit, offering wonderful views of the area. 4/6/18 - Leading up to the 25th anniversary of the Beach Watch Program this coming fall, we will be featuring a 'Beach - a - Week' of all the beaches the program monitors. All beaches featured are accessible to the public, and are a great way to explore your sanctuary! Beach Watch is a long-term shoreline monitoring project which was founded in 1993 by Greater Farallones National Marine Sanctuary. 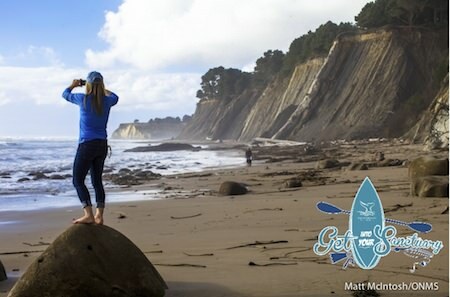 A program of the Greater Farallones Association, this year-round ecosystem assessment program is conducted by dedicated volunteers who regularly survey an assigned beach within the Greater Farallones and NOAA's Monterey Bay National Marine Sanctuary.Volunteers collect data on live and dead species of birds and marine mammals as well as human activities. They also report violations, detect oil pollution, and collect oil samples. Beach Watch is the first volunteer program of the National Oceanic and Atmospheric Administration (NOAA), and has worked for almost twenty-five years to provide: A baseline dataset on the presence of live and dead coastal wildlife and human uses; assistance to sanctuary management in the early detection of natural and human-caused environmental events; a network of volunteer expert surveyors who can respond to oil spills; education to the public about the coastal environment and how they can make a difference in protecting their beaches. 1/16/18 - Greater Farallones National Marine Sanctuary was designated on January 16, 1981! 7/14/17 - You're invited! On August 12th, we'll be holding a nation-wide "Get Into Your Sanctuary" celebration. From a walk on the beach to a surfing adventure, a visit to an aquarium or a sanctuary staff-led event, there is something for everyone and many ways to enjoy your national marine sanctuaries! To figure out where to go, what to do and get a sneak peak of what you might see, check out our Visit page. In 1994, seabird biologist Harry Carter had a vision: to restore the common murre colony at Devil's Slide Rock, which had been completely abandoned as a result of an oil spill and gillnet fisheries. Carter assembled a daring team, piloted zodiacs in rough seas, and climbed the rock to place decoys he hoped would attract the murres back to their old home. Year after year, that work continued, and more birds started breeding on the rock. Thanks to this long term commitment over the past twenty years, the colony today is now home to 2,000 nesting common murres. The copper rockfish (Sebastes caurinus) has pronounced spines and the rear two thirds of its lateral line is distinctly light which helps distinguish it from similar looking rockfish species. The copper rockfish can reach lengths of approximately 26 inches and has been know to live for 50 years!